Recent release “Too Busy To Cook With Dustin Morrell” from Page Publishing author Dustin Morrell is both entertaining and informative; this work teaches the reader how to improve and update the everyday meal. 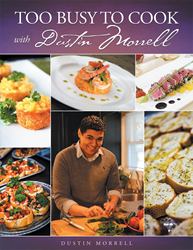 Dustin Morrell, a pastry chef, cook, owner of a catering company, family-man, food enthusiast, devoted writer and author, has completed his first cookbook “Too Busy To Cook With Dustin Morrell”: a delicious guidebook to creating delectable meals at home. Dustin would like to thank readers for stopping by and reading his story. He continues to thrive preparing over one hundred years of rich family recipes from his private collection to creating new promising healthy and organic recipes. Dustin also continues to give back to his community by helping clients seek a healthier lifestyle or helping them create a memory that they will never forget. Published by New York City-based Page Publishing, Dustin Morrell’s cookbook is the perfect work for any food fan and cook! “Too Busy to Cook” is designed for in-home cooks that want to take their weekly meals from drab to fab in minutes. Dustin Morrell compiles and complements many great tastes and textures while allowing an everyday meal to go above and beyond for one’s family and friends’ palate. Readers who wish to experience this appetizing guidebook can purchase “Too Busy To Cook With Dustin Morrell” at bookstores everywhere, or online at the Apple iTunes store, Amazon, Google Play or Barnes and Noble.